Are Greyhounds good family pets? Most retired racing greyhounds will adapt very quickly to life as your close companion or a family pet. Following the stresses of racing - both physical and emotional, greyhounds tend to move easily into a cosy lazy family life. Keep in mind that most will not have been in a home before so things like mirrors, vacuum cleaners, televisions, stairs, slippery floors, mirrors and glass doors will be new. Because greyhounds are from racing kennels they will usually know to toilet when they are taken out, so most will need little if any toilet training. They are also naturally very clean dogs, and will not want to soil their living areas. Most greyhounds will probably be crate trained and will know their create as their special safe place to relax. Crate training has become popular in many households and can often help your new greyhound to settle into home life as a pet. 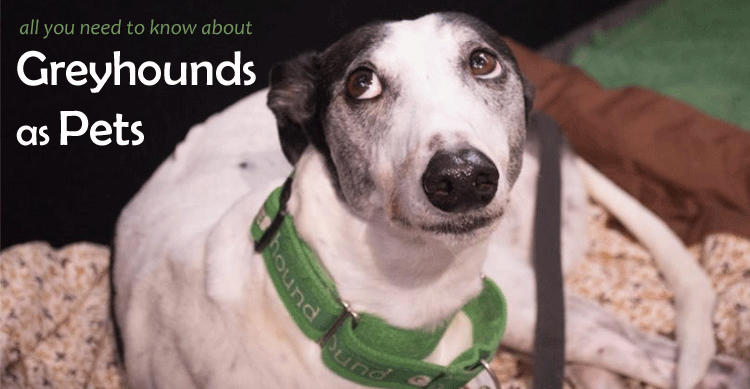 Greyhounds are extremely healthy dogs so often usually come with very few vet bills! Because of their diet when they were racing dogs, they can sometimes have some dental issues so a good diet and caring for their teeth is important. Most Greyhounds love travelling in cars, but because of their long bodies and high centre of gravity, some find it difficult to balance in normal sedans and travel best in hatchbacks or station wagons. Are Greyhounds good with children and other pets? Greyhounds are generally very gentle with children, prefering to walk away from a pestering child; but remember that young children (especially those under five) should never be left alone and unsupervised with any breed of dog. While racing, many greyhounds never experience other dog breeds or small animals like cats, rabbits and guinea pigs. Because they have been bred to hunt, greyhounds have a strong instinct to chase. Most will mix well with other dogs but they need to be introduced appropriately. Some retired dogs will get along well with cats; while others are too 'keen' to settle and won't live successfully with them. Can Greyhounds live in flats & apartments? Are Greyhounds easy to train? Please consider a boy if you've decided to share your life with a Greyhound. The waiting time will almost undoubtedly be shorter and you will end up with wonderful companion who has none of the problems that you may expect with a male dog. This information courtesy of the Greyhound Adoption Program (NSW), Inc. If you would like further information on adopting or fostering retired racing Greyhounds, email GAPNSW or contact their adoption rep on 02 9452 3446.